This 3/2/2 home is located in the much sought-after Gardens of Gulf Cove in Port Charlotte, FL close to the Englewood boarder. 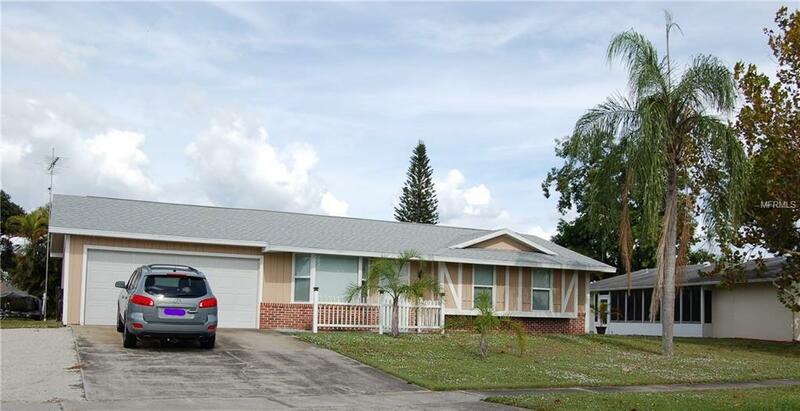 The home features a brand new roof, newer A/C unit and tile throughout the main living areas. There is a utility/laundry room located just outside the sliders off the covered tiled patio area. The 2 car garage measures 15x26 and provides ample storage space. There is access into the attic from the garage. The master bedroom has a double closet and sliders to the rear patio. There is a master bath with a walk in shower. The guest bath features a tub with shower. The living room has a large bay window and the kitchen offers enough space to add a dishwasher if desired. In the Gardens there are 4 lakes, underground utilities, sidewalks, street lights, county water and sewer. The low yearly fee of $332.75 includes 2 community pools (1 heated), tennis courts, shuffleboard, bocce play, basketball court, rec center, exercise equipment, pool tables and a friendly atmosphere. The beaches are located about 15 minutes away in Englewood or Boca Grande. Convenient shopping and dining are only minutes away. Additional Lease Restrictions Rentals Are Prohibited in 1st Year Of Ownership. All Renters Over The Age Of 18 Are Subject To Background Check Process And Most Obtain Approval Letter Prior To Occupancy Date. Amenities Additional Fees There is An Boat/Rv Storage Lot The Annual Fee is $90/Year. You Are Allowed To Park Up To A 32' Boat/Rv On The Side Or Rear Of Your Home. Pet Restrictions Renters Can Not Have Pets.